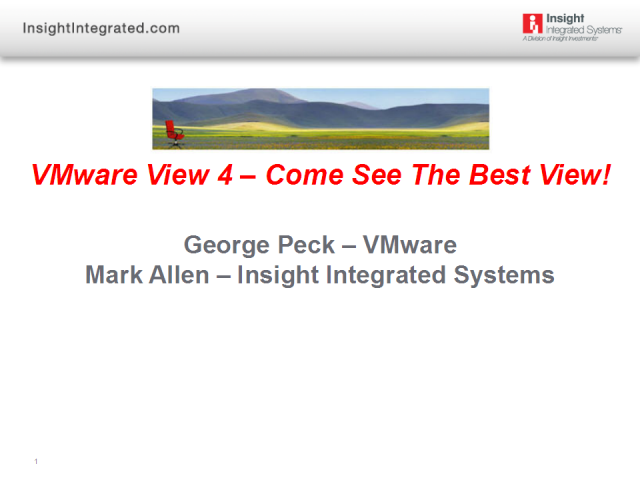 VMware View 4 is the only virtualization solution specifically built for desktops. Join us to learn more about how VMware View™ 4 delivers desktops as a managed service and provides the best-in-class desktop-user experience. •Manage, update, and provision thousands of desktops from a single management console. •Centralize your management of desktops, applications, and data. •Secure data by moving it from unsecure devices to the data center. •Reduce total cost of ownership and manageability. Come see the view everyone's talking about.